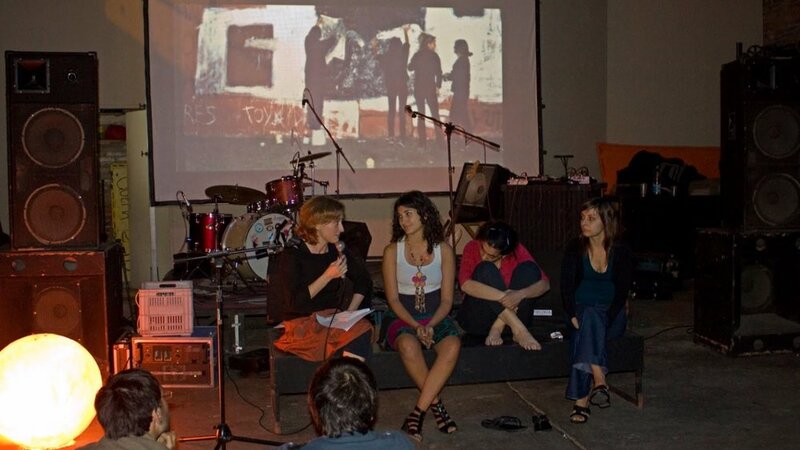 Grupo de Arte Callejero: Thought, Practices, and Actions tells the profound story of social militancy and art in Argentina over the last two decades and propels it forward. For Grupo de Arte Callejero (Group of Street Artists), militancy and art blur together in the anonymous, collective, everyday spaces and rhythms of life. Thought, Practices and Actions offers an indispensable reflection on what was done and what remains to be done in the social fields of art and revolution. Every new utopian struggle that emerges must to some extent be organized on the knowledge of its precedents. From this perspective, Grupo de Arte Callerjo situates their experience in a network of previous and subsequent practices that based more on popular knowledge than on great theories. Their work does not elaborate a dogma or a model to follow, but humbly expresses their interventions within Latin American autonomous politics as a form of concrete, tangible support so that knowledge can be generalized and politicized by a society in movement. Without a doubt this will not be the most exhaustive book that can be written on the GAC, nor the most complete, nor the most acute and critical, but it is the one GAC wanted to write for themselves. Grupo de Arte Callejero (GAC), Group of Street Artists, formed in 1997 out of a need to create a space where the artistic and political could be collectively reappropriated as a single means of production. Their work blurs the boundaries between militancy and art and develops confrontational forms and strategies that operate within determined contexts: the street, the occupation, the demonstration. From the beginning, their work has searched for a space for visual communication that escapes the traditional circuit of exhibition and exploitation, taking the appropriation of public spaces as its central axis of production. A large part of their work is anonymous in character, which allows for the continued elaboration of these practices and methodologies by like-minded individuals or groups. Many of their projects have emerged as collective constructions with political movements, groups, and individuals, creating a unique dynamic of production that is in permanent transformation due to this constant exchange and putting into political practice. Mareada Rosa is a translation collective based in Michigan interested in bringing critical work in the areas of politics and culture from North and South America into English. Its members are Catalina Esguerra, Laura Herbert, Hilary Levinson, María Robles, Brian Whitener and Silvina Yi. Since their formation in 1977, the Madres of the Plaza de Mayo (Mothers of the Plaza de Mayo) have made the disappeared visible through their bodies. The act of being in the plaza, occupying that space and circulating within it, gave form to the struggle against the impunity that existed during the worst of times in the dictatorship. Every Thursday, transcending the known cultural repertoire and iconography, they were present with their persistence in the Plaza de Mayo. Through their bodies in motion, they offset the proclamation of martial law and the prohibition against public meetings. Since Argentina’s transition to democracy, the Madres have prolonged and vindicated this embodied practice. The white handkerchiefs emphasize that the Mother’s action is highly symbolic and the use of public space is consciously strategic. The Mothers acted against the repressive system of representation that so effectively limited the possibilities of visibility and expression. For many years, “Living Ghosts” was the slogan used by the human rights organizations against those culpable for the atrocities. Since its appearance, the slogan was always linked to a forceful use of public space and of the accompanying image. The acts and interventions in the public space produced it as a site in which the traces of the recent past are transmitted and where these traces are placed in relation to the construction of public images. With the return to democracy came the continued push towards condemnation. At first, the testimonies of survivors, relatives, and witnesses occupied a central space. For many Argentines, the terrible stories of what happened opened many eyes and many ceased to deny the atrocities of years past. The CONADEP report and the trial of the ex-commanders constitute two paradoxical moments in the explosion of testimony. In this moment, the theory of the two demons was elaborated. A little later, still under the presidency of Raul Alfonsín, the laws of impunity are passed (Obediencia Debida and Punto Final). Finally, Menem signed a presidential pardon for those who had led the dictatorship’s state terrorism. The escrache that emerged from the works of H.I.J.O.S. also works in the realm of the symbolic. Both the Madres and H.I.J.O.S. use public space denouncing and marking the houses of the dictatorial repressors and their accomplices. Their action consists in signaling and narrating the links that connect thirty years of impunity with the present reality in Argentina. The Madres and H.I.J.O.S., even with their differences in strategy, do not accept the prohibition on public space. On the contrary, they use this as a stage on which they unfold a strategic cartography of action. This is a mode of action that emphasizes the role of memory as a function of the present, and not just the past. A live, active, and actual memory. We always think of the construction of memory in this sense: from the present, from the action, recuperating spaces, denouncing events and people, creating links between the past, present, and future. In this act of making every day the present, memory begins to be constructed from what was recuperated and from where one is intervening. In this way we move, from the escraches to the project of the Parque de la Memoria (Memory Park) in which the official objective was to pay homage to those disappeared between 1976-1983. In the face of the state-sanctioned outline of history emerged our first group initiative of working in a broader historical framework, inquiring into the causes and consequences of the dictatorship as a way of complicating the sense of historical time we were trying to put into question. We arrived at this approach from the action-image that we practice in the escrache, as the escrache was the opening that pushed us into more complete and complicated projects. In the act of denouncing, we felt the necessity to deepen our work, both discursively and textually, making complex the image of the condemnation. Not only for a mere theoretical undoing but also to take responsibility for limitations when it comes time to communicate. We need to, then, feed from other discourses to create new images. It is in this way that we construct a rich collective reading of diverse materials on the dictatorship and the period that preceded it–from a different analysis. We propose research as part of this communication process using images that from starts from feeling and not purely from a rational place. At the same time, we have formed strong bonds with H.I.J.O.S and with other human rights organizations. These neighborhood actions have precedents such as what happened in San Telmo beginning in the mid-90s with the group “Encuentro por la Memoria” (“Meeting for Memory”) and its work there. For a long time, together with the San Telmo assemblies, they organized marches that passed in front of the homes of the neighborhood’s desaparecidos, or the places where they were kidnapped. The important thing here was to create a mark, but in an inverse way from what was achieved with the escraches, where the mark was for the repressor. The mark of the homages works to create a sense of everyday memory and to construct micro-histories. It wasn’t about looking for a symbol for the desaparecidos, but rather we did think about what could characterize each one of them. In that way, the pictures of the disappeared of San Telmo were resignfied using only their gaze. During the march-homage we placed little squares with the cropped photos, together with the name and former address of each person. At the same time we told the neighbors about who lived or worked in those places, who had been kidnapped in such in such corner or building. These type of actions were realized in several different neighborhoods in the city of Buenos Aires.